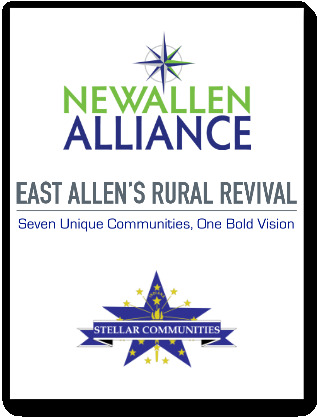 In a 5-1 vote Thursday, the Allen County Council approved $1.25 million for the NewAllen Alliance's Rural Revival Regional Development Plan. The NewAllen Alliance represents a collection of municipalities in East Allen County – Leo-Cedarville, Grabill, Harlan, Woodburn, New Haven, Monroeville and Hoagland. According to documents submitted to the County Council, the money approved Thursday will go toward the Allen County Commercial Facade Program, the Cedar Creek Parks Trail, the operations/maintenance fund for Harlan and Hoagland projects, and leadership and place-making training and support. Projects supported by the Rural Revival plan in East Allen County are also in contention for funding through the state's Regional Stellar Communities Program. The project is the culmination of four years of work, said Kent Castleman, president of the NewAllen Alliance. “We are happy to be one of five finalists now; there were six finalists but one of the finalists backed out last week,” Castleman said. Castleman said the goal of the program is to provide economic sustainability, regional vitality and livable communities by improving upon existing strengths and building new quality-of-life improvements. The program is focusing on downtowns, parks, trails and sidewalks, senior housing and community health, Castleman said. “There is no doubt that Fort Wayne is the economic engine of the area, but we also know that our communities have a lot of employers,” Castleman said, emphasizing BF Goodrich in Woodburn as an example. Several proponents of the project spoke during the public comment segment of Thursday's meeting, including New Haven City Councilman Steve McMichael. McMichael is running to replace outgoing New Haven Mayor Terry McDonald. The NewAllen Alliance originally asked for $2 million, but that was reduced before Thursday's meeting to $1.75 million. However, a motion to fund that amount was defeated in a 3-3 vote. Councilman Larry Brown, R-4th, was the sole vote against the revised $1.25 million commitment. Although Brown described the plan as a “very worthy project” with great quality-of-place improvements, he said the County Council has other, more pressing fiscal responsibilities including the court, the sheriff, the jail, prosecutor and public defender. Brown said that between the $4.25 million approved by the county commissioners and $3.3 million from the Allen County-Fort Wayne Capital Improvement Board, the public money already put into the project is adequate and in his opinion does not need to be increased.